After many failed attempts of flat and thin Gluten Free cookie recipes I tried pastry flour to puff them up! My boys and I just love the cookies made from using pastry flour! I don’t think I will ever go back to All Purpose flour for my cookie baking. These cookies are fluffy and delicious! I used milk chocolate and white chocolate chips in this recipe; I would have added nuts if I had any…next time! 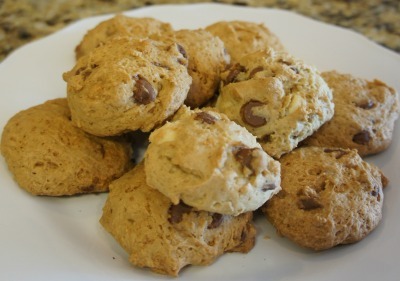 Fluffy and delicious gluten-free cookies! In large bowl cream together butter,brown sugar, sugar. Add 3 eggs and vanilla extract to butter and sugars. Sift xanthan gum, pastry flour, baking soda, baking powder, and salt together and then add to mixture. YUM!! Pinning so I can find this later! These look so fluffy and fabulous!! I love the thicker cookies!! My family loves chocolate chip cookies, so we will have to try these!